Most philosophers say that bravery is just an act of hiding your fears. They say it probably because they have never met the soldiers of Indian Army! Hiding or being afraid of something is not the case with the soldiers of Indian Army. Indian Army has produced many such brave soldiers over the years which is evident from the fact that we have had success in most of our military operations and have lost just one war till date. Today we will read about one such badass soldier of the Indian Army - Subedar Major Yogendra Singh Yadav. 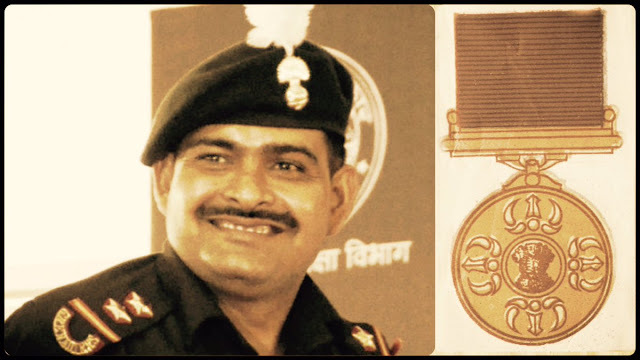 Subedar Major Yogendra Singh Yadav is a Junior Commissioned Officer(JCO) of the Indian Army. He was awarded India's highest military honour, the Param Vir Chakra, for his 4 July 1999 action during the Kargil War. He was married for just 15 days when he was called for national duty. He was just 19 years old when he received the honour and till date is the youngest recipient of the award. The Param Vir Chakra was announced for him posthumously, but it was soon discovered that he was alive and was recovering in a hospital, and he was mistaken for another soldier of the same name who was killed in battle. He is one among the 3 Param Vir Chakra recipients who are presently alive. The other two are Naib Subedar Sanjay Kumar and Honorary Captain Bana Singh. Bollywood actor Manoj Bajpayee played the role of Subedar Major Yogendra Singh Yadav in the film LOC Kargil. The action scenes played by Hrithik Roshan in the Bollywood film Lakshya on Tiger Hill are inspired from his heroic deeds in the war. Yogendra Singh Yadav was born on 10 May 1980 in Aurangabad Ahir village of Sikandrabad, Bulandshahr District, Uttar Pradesh. Bravery, valour and love for the country came naturally to him as he was raised in a family of soldiers. His father Karan Singh Yadav had served in the Kumaon Regiment, participating in the 1965 and 1971 Indo-Pakistan wars. His younger brother Jitendra Singh Yadav is also serving in the Indian Army. At a very young age of 16 years and 5 months he got enlisted with 18 Grenadiers unit and was part of the commando platoon 'Ghatak' during the Kargil war. His platoon was tasked to capture three strategic bunkers on Tiger Hill in the early morning hours of 4 July 1999. Tiger Hill (also called Point 5062 because it is 5062 m high) is a mountain in the Drass-Kargil area of Jammu & Kashmir, India. It is one of the highest peaks in the area. The idea was to climb the hill from a point from where the enemy could never had imagined. They had to climb more than 100 feet at an angle of almost 90°. Yadav volunteered to lead the assault. He climbed the cliff face and installed ropes that would help his fellow soldiers to launch further assaults on the feature. "We were surrounded by death from all sides, we knew we were going to die, but we were determined to inflict maximum casualties and we kept moving forward with this spirit. ", he said. Halfway up, an enemy bunker opened up machine gun and rocket fire which killed the platoon commander and two others. In spite of having been hit by multiple bullets in his groin and shoulder, Yadav climbed the remaining 60 feet and reached the top. He was severely injured but he still crawled to the first bunker and lobbed a grenade, killing four Pakistani soldiers and neutralizing enemy fire. This gave the rest of the platoon the opportunity to climb up the cliff face. Yadav then charged the second bunker along with two of his fellow soldiers and engaged in hand-to-hand combat, killing four Pakistani soldiers. "An enemy soldier also took an aim at my chest and fired a bullet, but it ricocheted off the Rs 5 coins I had kept in my pocket," Yadav told PTI. He was wounded so severely that the enemy thought he was dead. Yadav said, "When I lay wounded, the enemy took me as dead, they also fired couple of bullets to check whether I was alive or not. But I made them realise that I was no more." "I rolled over and opened fire from 3-4 sides to make the enemy think that reinforcements (of the Indian troops) had come. Had they known I was alone, they would have killed me," Yadav said. "The enemy thought reinforcement had come after presuming that they had killed us all. But Pakistan Army has such a low morale that they gave up at that point," he said, adding his team had killed 25-30 enemy soldiers in all. Overall Yadav was hit by 14 bullets and his left arm almost got ripped off. The platoon subsequently succeeded in capturing Tiger Hill and Yadav played a major role in the capture of Tiger hill. Must watch : Subedar Major Yogendra Singh Yadav's interview on Doordarshan channel.